I’m not sure if you guys know this or not, but it’s officially fall cookbook season, and well… there are just so many great new cookbooks being released! SIDE NOTE: thinking about doing a Holiday Gift Guide for cookbooks, what do you think? I’m really excited to share this recipe with you today because it comes from Meike Peters new cookbook, Eat in My Kitchen. Ever since embarking on this journey of writing a cookbook, I’ve realized just how much work goes into writing a book. You guys, it’s no joke!! I am currently working through all the edits, and while I am so excited to be getting closer to sharing the book with you all, it’s also crazy scary…and well, my eyes are slightly tired. Basically I am just praying that when the book is released you guys will all love it to pieces! It’s so awesome that I have the opportunity to help others celebrate their cookbook release by sharing a recipe from their book with you guys! It’s fun for me, and such a great way to let you all in on the books I am loving! SO. Today we are talking about Eat in My Kitchen. Oh man, this book is just packed to the brim with recipes I love, so many great ones and so many that I know you will all love. 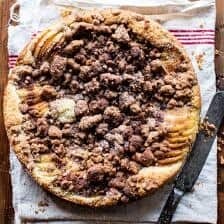 But when I stumbled on this most perfect cinnamon fruit crumble cake, I knew that this was the recipe I needed to make and share with you all. 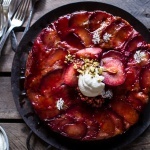 Let me just start off by saying that this cake is all kinds of incredible, AND that Meike made it really adaptable to all of the seasons by suggesting three types of fruit you can use – plums, rhubarb or apples. Seeing as I am obsessed with all things fall, and all things honeycrisp apples, I went with apples as my fruit… so, so, so good! What I love most about this cake is that while some fruit cakes can be on the dry side, this cake is anything but. It’s moist, buttery and almost even doughy in the center if you cook it for just under and hour…which I did…and it was perfection. This is the perfect cake to serve warm, dusted lightly with powdered sugar. And yes, I do think this cake is acceptable, not only for dessert, but also as a very special (i.e. something to look forward to) breakfast or mid-day snack. <–hey, apples qualify for both breakfast and a snack ? 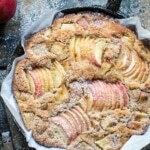 This cake is loaded with apples, is crazy buttery, and topped with the most cinnamony crumble ever. Preheat the oven to 350 degree F. Butter a 10-inch springform pan. To make the cake: in a large bowl, use an electric mixer to beat the butter, sugar, and vanilla seeds for a few minutes or until light and fluffy. Add the eggs, 1 at a time, incorporating each egg in before adding the next. Beat for 2 to 3 minutes or until creamy. In a medium bowl, whisk together the flour, baking powder, and salt. Add this to the butter-sugar mixture and mix with an electric mixer for 1 minute or until well combined. Scrape the batter into the butter springform pan and arrange the apples on top, pushing the apples slices gently into the batter. For the crumble, whisk together the flour, 2/3 cup sugar, vanilla seeds, and 2 teaspoons cinnamon in a large bowl. Add the melted butter and mix until crumbles form. Sprinkle the crumble over the fruit. Then in a small bowl, whisk together 2 teaspoons sugar and 1/8 teaspoon cinnamon, sprinkle over top of the crumble. Transfer to the oven and bake for 50-60 minutes or until golden on top. If you insert a skewer in the center, it should come out almost clean. Let the cake cool for at least 15 minutes before taking it out of the pan. *Adapted with permission from [Eat in My Kitchen | https://www.amazon.com/Eat-My-Kitchen-Cook-Treat/dp/3791382004/ref=sr_1_1?s=books&ie=UTF8&qid=1476066354&sr=1-1&keywords=eat+in+my+kitchen] by Meike Peters. It’s the right thing to do – trust me. That is a great idea Rhian, I’ll look into it! ? Anyway thank you for the good luck, I am super excited and cannot wait for it to be out! Awesome! I will definitely look into that! ? Thanks so much Anna! This looks amazing! 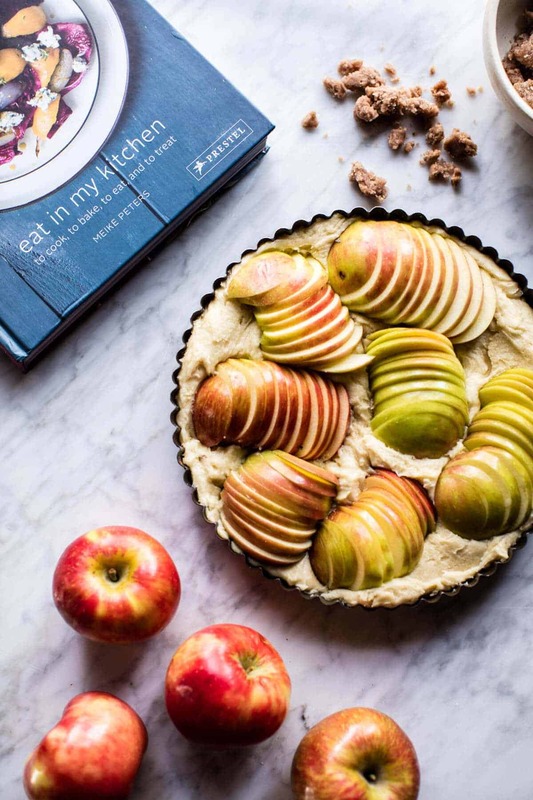 Particularly loving that photo of the apple slices prepressed into the uncooked dough – nomnomnom! Very excited for your cookbook! That is so awesome to hear! So happy you loved the apple cider Rebecca, I hope you love this as well!? 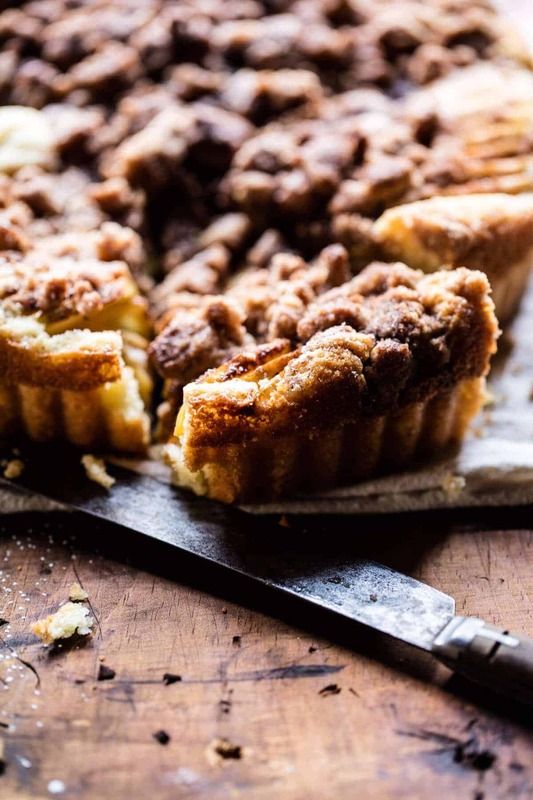 This looks incredible, I love apple and cinnamon as an autumnal combination. Yay thank you so much Lisa! The idea of a cookbook list for gift giving sounds interesting. When might we see you listed on Amazon?? Thanks so much Nancy! The book should be listed around the start of June! Can’t wait for the fragrances of this recipe to fill my house later on today! Thanks for sharing this recipe, Tieghan. I’m sure other bloggers will be doing the same with recipes from your book once it’s released! I look forward to holding it in my hands. Thank you so much Jean! I hope you enjoy this one! Dear god. The crumb on that cake is so serious! I love it! Can’t wait for your cookbook to come out! i’ll be first in line! YAY! So happy to hear that Jessica, thanks so much! Well, you know, every time I come to “your place”, I’m amazed to see your tempo, ideas, quality of dishes and photos you set going that often ! Bravo ! Yes, a cookbook gift guide is a great idea — and more than that I’m looking fwd to your cookbook! Wow! So yea I need to make this soon – I have some fresh picked apples waiting for an invite to this cake! Awesome! I hope you love it Kathy! You know I’m loving this one Tieghan! All girls from Jersey love their crumb cake! 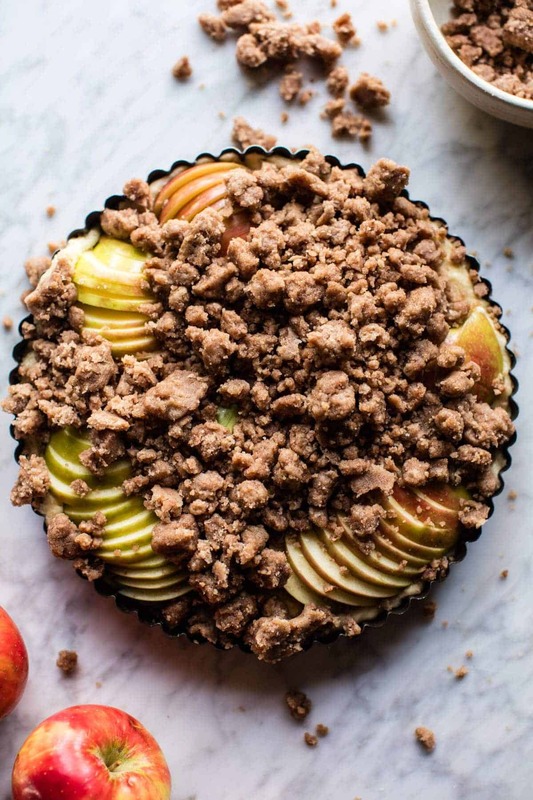 All those apples and all that crumb = perfection! Perfect! I hope you love it when you try it! This cake is soo gorgeous and I just love that it’s loaded with apples! I don’t have a 10″ springform pan. It looks like you used a tart pan instead? I’ll use that! Looks delicious ! Let me know if it’s easy to get this cake out of a tart pan! I want this for breakfast! Thx! Hey Debi! I actually used a spring form pan and recommend that you used something with higher sides. How about a 9×13 inch baking dish? it will make a square cake, but that will be great! A tart pan doe snot have high enough walls. Let me know if you have questions. Thanks! Hi! If I bake this in a 9 by 13 inch pan, how long do I bake it for and would it be best to bake it in a glass baking dish instead of cast iron? Looking forward to trying this cake!!! Hey Abby! I am not sure on the baking time since I have never baked this in a 9×13 inch pan, but I would think the baking times would be similar. I would use a glass dish. Hope you love the cake! Aiaiaiiii this one looks right up my alley!!! Gotta try it soon! What if you don’t have a tart or springform pan? Could you bake it in a glass baking dish? That crumble topping looks out of this world! This cake looks incredible! It looks pretty easy to make too! 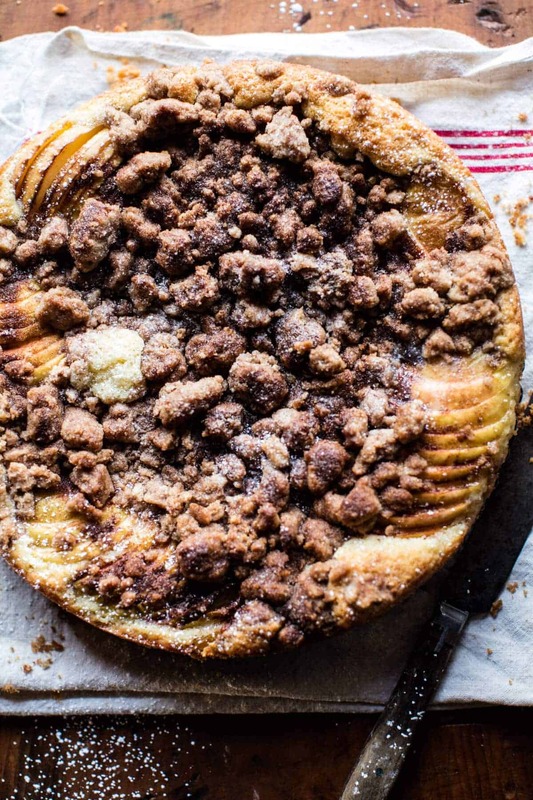 Nothing beats a good fall dessert where you can combine honey crisp and cinnamon! Can’t wait to try it! Yes! I hope you love it, thank you Caitlin! Anyway, love your blog always very much! So happy you love my blog, thank you so much Aysha! This looks and sounds amazing! Thanks for sharing! This cake looks like everything that dreams are made of. Seriously it looks so good! I cannot wait to make this one day! Thanks Brooklyn, I hope you enjoy it! This looks so yummy! Can’t wait to try making it with one of my friends. That sounds so fun, I hope you two love it!! Hi Laurene, so happy you are making this cake! Let me know how it is when you take it out/ if you have any questions! Thanks! Wow that ice cream on top sounds AMAZING!! Thanks so much Sheila! This looks heavenly!! And I love the idea of a cookbook gift guide. I have too many to count, but I love gifting cookbooks to others since cooking is something I’m really passionate about – plus, who doesn’t like to make or even just ogle at good food?! Looking forward to seeing yours! Haha right?! Love cookbooks, thanks so much Christine! Looks absolutely perfect as always and you know I can’t wait for your cookbook! This is seriously the most gorgeous fall cake ever! OMG I’m obsessed with that crumble!!!!! Congratulations on making the absolute most photogenic crumble topping ever!!! How beautiful!!! Wowsas! 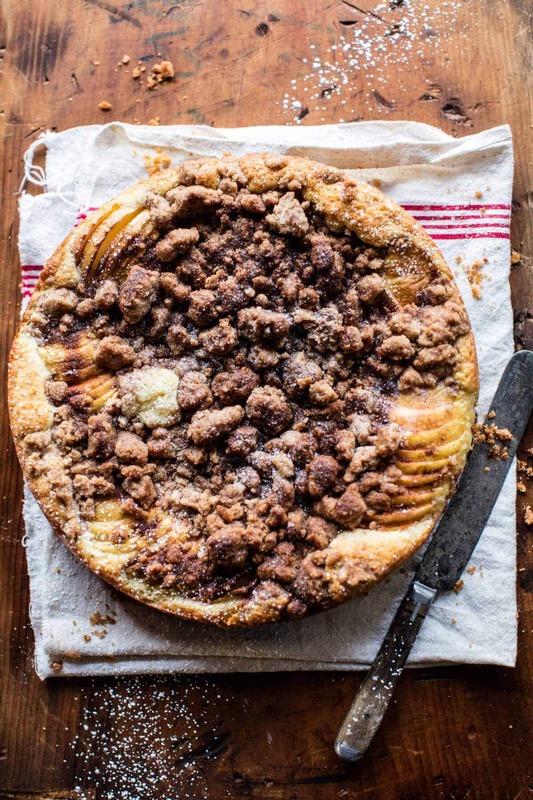 Also, anything hybrid of apple and coffee cake is perfectly up my alley. We have been enjoying so many of your recipes lately!! Thank you for such creative posts!! Yes on the cookbook guide! That cake is looking mighty fine as well! I just went apple picking! 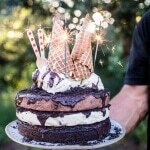 This will definitely be on my baking list for this weekend. Thank you for this Tieghan!! Thank you Sabrina!! I hope you love it! Thank you soooo much, Tieghan! This cake is a beloved family recipe and your post touches me so much. It’s beautiful! I can’t wait to see your book! OMG this looks amazing! 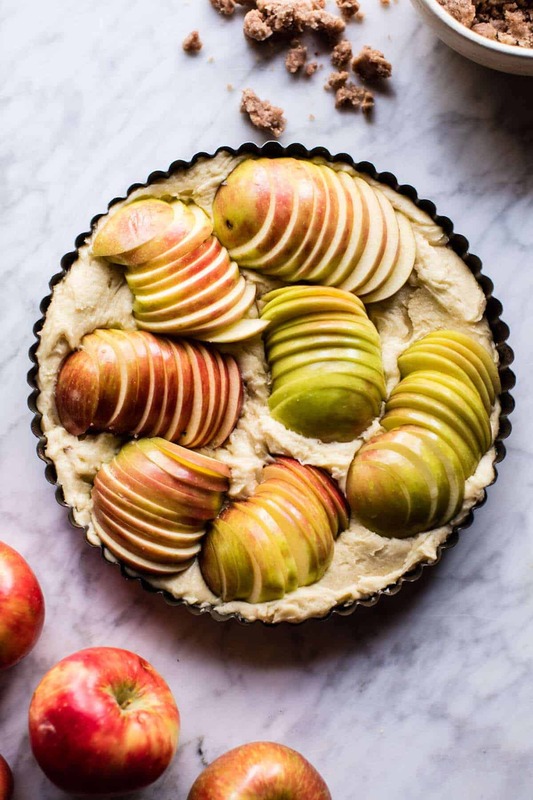 I’ll definitely making this over the weekend, but I’m wondering – what apple would you recommend as a sub if I can’t find honeycrisps at my local grocery store? Hey Brie! Use any apple that you personally love. granny smiths would be great! ? Let me know if you have questions. Thanks! Such a gorgeous cake, that crumble topping is everything! So happy you are loving it! Thanks Laura! Good luck on the cookbook! I can’t wait to pick up a copy, your recipes are brilliant! Thank you so much, really happy you are enjoying my recipes! And I hope you love my book just as much, I am super excited for it to come out! I think this cake has just bumped pumpkin spice out of first for my favorite Fall flavor. Just made the recipe tonight – used a GF flour blend and added cardamom to the crumble. Holy cow. I could take a bath in that stuff. Always love your recipes, Tieghan! I’d love to see you do a cookbook gift guide for the holidays. Can’t wait for your cookbook, too! So happy you loved this so much! Thank you Rachel! I like to include some type of apple dessert for Thanksgiving, along with the traditional pumpkin and pecan pies. I think this will the be the one this year. Thank you! Awesome! I hope you love it, thanks Jann! Hi! Just finished making the cake as a test run for Thanksgiving. I was wondering how you get the crumble to get so dark? The cake part on mine is cooked through but the topping is very light. Do you have any tips? Thanks! I just made this for a trial run for Thanksgiving and wasn’t that happy with the final outcome – mostly because of the cake part, which came out pretty dry. I only baked it for 50 minutes, I wonder if it overbaked a bit somehow. HI Michconnors, it sounds like it was over baked. What was the oven temp at? Is it possible that your oven cooks things higher than it reads? Hope I can help more. Let me know if you have other questions. Thanks! It sounds like it did but I’m not sure how, I had it at 350. I wonder if it’s because I had a dark (nonstick) springform? I read recently in another recipe site that there is a cooking time difference between regular aluminum springforms and the dark ones? HI! Dark pans can cook things at a faster pace. I use a non-stick spring form pan. Let me know if you have questions. Gorgeous cake! How far in advance can the cake be made? About a day in advance. Thank you! I had this bag of apples i didn’t know what to do with. Made this yesterday & it’s really great. The presentation is gorgeous! I wanted it to look like your pictures & I have a deeper dish glass pie plate. Worked perfectly. The kids loved it. We just made this cake with pears instead of apples since that is what I have in the fridge. It came out great and the house smell AMAZIN!! Good Luck with your cookbook! We are working on ours and it is soooo much work. This was OUTSTANDING! So easy to make and unbelievably delicious! My kitchen smelled divine. When can we preorder your book? Thank you! Pre orders should start this spring! 🙂 Happy Holidays! This looks so amazing! Just decided I’m going to bring this for Christmas dessert. Wondering how far ahead I can make it? Keep up the good work! Love so many of your recipes. Trick question. EVERYBODY is up for cake! 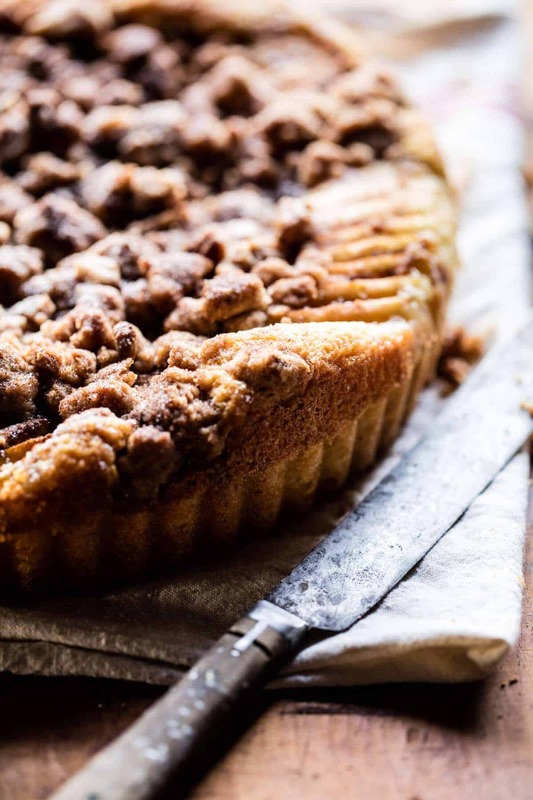 In particular, I would absolutely fall weak in my knees for anything with a sweet, crunchy and aromatic cinnamon crumble! 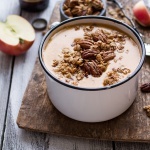 What a perfect recipe for the fall and winter season! Just made this for my boss’s birthday tomorrow and it smells AMAZING!!!!! AH! Hope you guys love it! Let me know how it goes! I am making this Friday for my friends! This will be so delicious! Can I come stay with you for a few weeks! Haha seriously your food looks amazing, I want to dive in and cook everything. I love cooking but I think I have to step up my game! I am going to get your cook book asap! I hope this turns out amazing for you and your friends! Lol I would totally love to have all of you guys over if I could! Thank you so much Jill, & I hope you love the cookbook when you get it! Hi! This looks incredible and i cant wait to try it, but what would be the equivalent of fresh vanilla seeds compared to vanilla extract? Extract is all I have on hand! can I sub oil for the butter? My husband’s family owns a 4 generation dairy farm. Their Christmas tradition is to celebrate on Christmas Eve as they always allowed their farm workers to have Christmas Day off. So our tradition now is to stay all night Christmas Eve (we live out of state) and my husband will go out on the farm Christmas morning and I stay back to help make breakfast for when they are done with chores. This year I made the Cinnamon Apple Crumble Cake and it was a hit! Everyone loved it! It’s a great cake to pair with coffee or tea or milk. I think next time I make it I’ll try and add a cinnamon swirl through the cake for a little extra surprise. I would highly recommend this! That sounds like such a sweet tradition! I am so glad you and your family enjoyed this as well Brittany! Thank you! Your recipes never fail me! Having family to dinner last night I wanted to make a cake with apple and cinnamon (such a perfect combination). I always head straight to your blog before any other et voila! This little gem popped up and it couldn’t have been more perfect. My sister-in-law thought I was joking when I said I’d made it!! Oh and I also made your brown butter and sage mash to go with the Bourguignon I served! So glad you do what you do! And finally; like you – I love to cook, bake and take photographs. Your blog is a daily inspiration, Thank you so much! Wow that is so amazing Maxine! I am so glad this turned out perfectly for you and you’re enjoying my recipes! Thank you so much!